Our interest is in camellias as good garden plants, not blooms for the show bench or scientific analysis. We remain focused on the garden. The first camellias started to come into flower here about three weeks ago, at a time when we were still reluctant to admit that summer is over for another year. The fact that we can flower camellias from March to November is perhaps one reason why they have been so popular in New Zealand. At this stage, it is only a few species and the very earliest sasanquas with flowers. Microphylla and brevistyla were the first and while their flowers are soft and easily damaged, there are so many still to open that the simplicity and brevity does not pall. Mark had to get out the hand lens to pick the difference in the flowers of these species but microphylla seems to grow a little larger as a bush. We are raising a batch of microphylla seedlings for use as a hedge in the future, though we wonder whether what we have are natural hybrids between the two – the parent plants are in close proximity. Punicieflora is also in flower with its tiny little daisy-like pink flowers. These are understated but charming in their own way. The foliage is a bit of a pale olive green in full sun but the upright to arching growth and small leaves mean it is a good subject for clipping as a feature plant. I am gradually shaping ours to resemble a two metre high tiered cake stand. 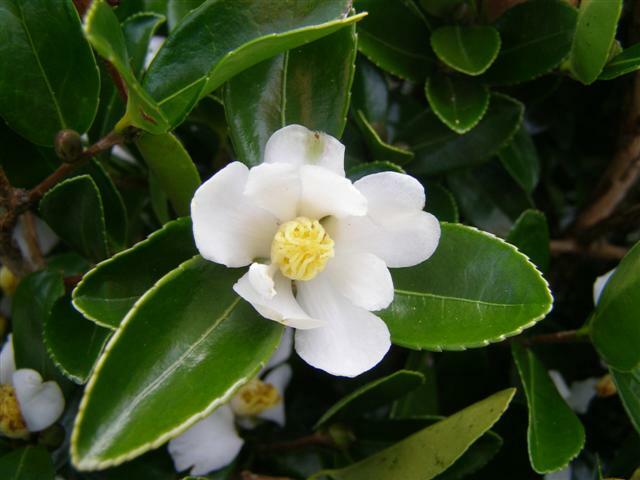 Sinensis, the tea camellia, is also in flower but these are of little merit despite the form we have being pink. We have tried brewing our own tea and blind taste tests from the tasting panel of two felt it came creditably close to our favoured Earl Grey. Amongst the sasanquas, Crimson King is the most advanced. Mahogany red perhaps a generous descriptor of the shade of red (in the Camellia Nomenclature), it being closer to pink-red but it is an open, graceful shrub that we keep pruned to 2.5 metres. Elfin Rose has her first flowers showing colour. In the nursery with protected conditions, flowering is usually advanced by a good couple of weeks and lo and behold, we have the first flowers on Mark’s camellia Fairy Blush. This was the first camellia he named, an open pollinated lutchuensis seedling and because it wasn’t a controlled cross, Mark was rather off-hand about it. Now we feel that it is the one that got away from us and we should have protected it with a plant patent. Hindsight is a wonderful thing. We simply did not see that it was going to be such a commercial success but a pretty little scented camellia which flowers in abundance for a good six months is a recipe for good sales. All the same, it can be a little galling when an Australian nurseryman visits and tells you just how well he has done out of Fairy Blush. 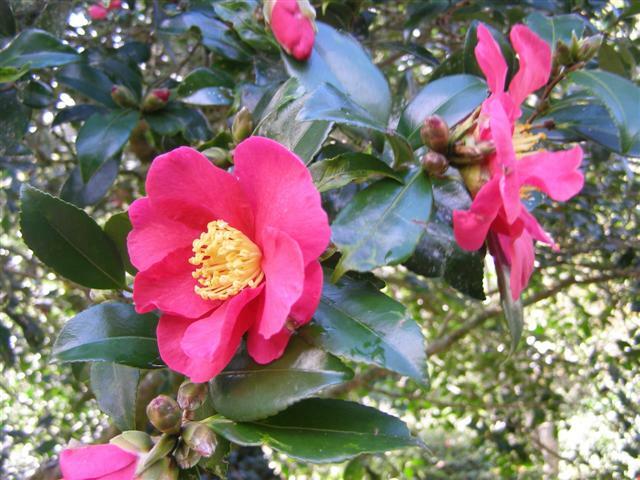 This entry was posted in Camellia diary and tagged autumn flowering camellias. Tikorangi The Jury Garden, Camellia brevistyla, Camellia Fairy Blush, Camellia microphylla, Camellia puniceiflora, camellias in New Zealand, Jury camellias on 7 April 2010 by Abbie Jury. Little Camellia brevistyla is in flower already, even before the sasanquas are showing colour. Individual flowers only last a day or two because they consist of a single row of between five and seven soft petals which pass over quickly but as they are tiny, measuring about 2.5cm across, they disintegrate quickly and there are plenty coming on. And the pristine white contrasts well with the dark green, small leaves. Brevistyla is a great candidate for clipping but it is also one of the best camellia options we have seen as a replacement for buxus hedging. It suckers and layers a bit which helps to make a dense hedge and it sets abundant seed so if you can find somebody with one plant, you could gather their seed (and probably seedlings) and raise your own hedge at no cost. While you will get some variations amongst the seedlings, these will be minor and barring the occasional freak (possible but unlikely), they won’t look different to the parent. While it is recorded as growing relatively tall in the wild in its native habitat of Taiwan and parts of mainland China, the plant we have in the garden hasn’t got much over a metre in a decade. We have Camellia microphylla as well which has to be closely related to brevistyla and have raised microphylla seed as our replacements in reserve, should our buxus hedges become blighted. It grows a little taller than brevistyla but it wasn’t until Mark got out with a magnifying glass and analysed the subtle variations in the stigma length that he worked out the difference between the two species. Both make delightful autumn pictures with simple white flowers and dark foliage. 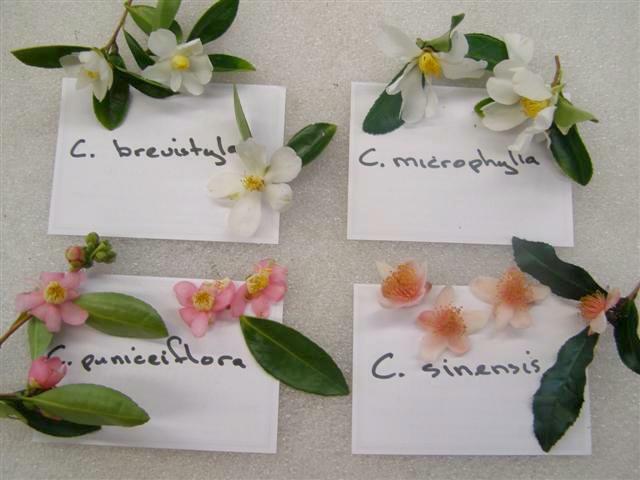 This entry was posted in Plant collector and tagged Abbie Jury, buxus replacements, Camellia brevistyla, Camellia microphylla on 7 April 2010 by Abbie Jury.